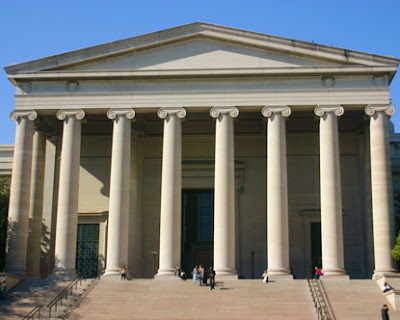 My Visit to National Gallery of Art and the Smithsonian National Museum of Natural History in Washington, D.C. While visiting Mat's family in Washington, D.C., we ventured out to the National Gallery of Art and the Smithsonian National Museum of Natural History. I was thrilled by the collection of Van Gogh paintings in the gallery. I am next to Vincent Van Gogh's painting. Women tend the trees in the olive grove. Close up of Van Gogh's brush strokes. Van Gogh told his brother that a "Mousme is a Japanese girl." He made several drawings before painting La Mousmé. Close up of Girl in Whites hands. Van Gogh painted the Roulin family several times, especially baby Marcelle Roulin. He painted her five times. Baby Marcelle grabbing his hand. I wonder why the baby is wearing a ring. Van Gogh's collection includes seven of his paintings, but only these were on view. I was also excited to see Pablo Picasso's original paintings. I stared at this painting for fifteen minutes. I was lost in it. I cant imagine how long the details of the clothes took. Eugène Boudin was one of the first French landscape painters to paint outside. What I really liked about this painting is the sky. The colors of the sky are so beautiful. I had to capture this image because when I passed by it the first time I thought it was a photograph and nothing more,but then when I passed by it again, I noticed that it was not. This is a large-scale photo realistic painting. This artist is severely paralyzed, but yet he does not let anything get in the way to do what he loves. This painting captured my eye because the painting has many objects, but yet the composition intrigues the eye. The light source and the shadowing also fascinated me. The details in this painting are incredible. The flash of the camera cannot capture the beauty of this painting. This painting remains beautiful even with the lines of age. The gesture of her hands are gentle and smooth. Even though you can capture everything with a camera, a realistic painting is still more intriguing. The walk way to the east building was covered with fascinating lights. There are other amazing paintings in the gallery by Paul Cézanne, Gustave Courbet, Jean-Baptiste-Camille Corot. Edourd Vuillard, Camille Pissarro, and many more. The photos below were taken from the Smithsonian National Museum of Natural History. This is one of the oldest known artist's palettes that was used to paint in the caves. These are some of the earliest sculptures that were found thousands of years ago. Its a horse and a figure of a women. Oooh! I visited this gallery many years ago. Nice to see it hasn't changed all that much. It's still as lovely as it ever was. btw..thanks for visiting my blog, and subscribing to my youtube. I haven't had time to check out your channel yet, but I will. I just started filming again yesterday, so I should have new videos soon.